Following Pete’s dismissal from The Beatles on August 16th 1962, he was immediately approached by Rory Storm & The Hurricanes. They wanted him to take Ringo’s place, who had ironically replaced Pete in the Beatles. Pete declined. Epstein contacted Pete asking him to consider joining another of his groups, The Merseybeats. Brian wanted to mould the band into another Beatles. Again, Pete declined. A month after Pete’s infamous exit from the Beatles he finally settled into his new role with Lee Curtis and The All Stars. 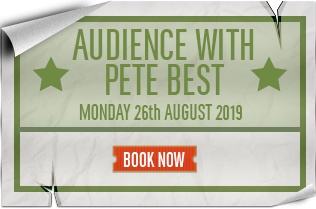 With Pete as the backbone of the group, the band toured the UK and Germany, with an ever-growing fan base who were to witness a head-to-head competition between Pete’s new band and their rivals, The Beatles. In 1963 the band was awarded second place in the Merseybeat Poll, being beaten into second place by a narrow margin from the winners – The Beatles! The highlight of the year was when Lee Curtis secured a recording contract with Decca. Pete and the All Stars eventually decided to split from Lee and develop their own distinctive sound, again successfully completing a successful tour of the UK and Germany. The manager responsible for turning down the Beatles at Decca, Mike Smith, decided that Pete and The All Stars was just the band that they had been looking for. Now under contract from Decca, the band’s name was changed to The Pete Best Four. They released a number of singles and appeared on TV in the UK’s number one music programme Ready Steady Go. The Pete Best Combo completed a European tour prior to visiting the USA. Once in America the group recorded in New York for Bob Gallo and later, The Cameo Label. Following their recordings, the band embarked on a tour of the US and Canada. During 1960 the Silver Beatles played without a permanent drummer. Finally, when their manager Allan Williams secured a tour of Hamburg, it was decided that the drummer situation had to be solved. The solution was Pete Best. The band knew Pete from a club they had often played and now frequented, The Casbah – where Pete’s own group (The Blackjacks) were resident. During their first tour of Germany in 1960 the band played the Indra Club and the Kaiserkellar. It was on this tour that The Beatles met Astrid Kircher and Klaus Voorman. Beatle photographer Astrid later married Stuart and Klaus designed the cover of ‘Revolver’ and went on to play bass with John. 1961 was the year that Brian Epstein was so impressed with their sound and the ever-growing number of fans, he approached The Beatles with a management offer. Upon their successful return to Liverpool as Polydor recording artists, growing enquiries at Nems Record Store for the single caught the attention of owner Brian Epstein. Interested in the band he arrived at the Original Cavern Club (the club where Pete’s mother Mona Best secured their first booking) to watch the Beatles. Following their 1960 tour success, The Beatles were invited back to Hamburg to play alongside the resident house musician at The Top Ten Club. It was here that record producer Bert Kaempfert first saw The Beatles and Tony Sheridan. He liked what he heard and offered to record them together for Polydor. The result was their first recording, ‘My Bonnie’. A RECORDING CONTRACT WITH EMI. Brian Poole & The Tremeloes, because he feared that the band was not sufficiently commercial enough for a recording deal. It was in Hamburg that Epstein broke the news to the band that they had finally secured a recording contract with EMI. It was on their first recording date in June 1962 that they met George Martin at Abbey Road Studios. It was at Abbey Road that The Beatles recorded Love Me Do. The finished song became their first hit in October 62 and when released later in early 63, became their first #1. The Pete Best Band delivers the raw, thumping intensity of the Beatles’ savage sound during the early sixties. The band are proud of their authentic sound and energy. Right from the first beat, you’ll be immersed in nostalgia, listening to ‘the best years’ of the beatles, 1960-62.